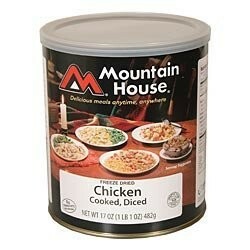 Our Backpackers Pantry and Mountain House Foods both offer 25 shelf lives. Be protected now and for the next 25 years. September is the official national preparedness month and because of this, Nitro-Pak is offering their biggest sale of the year on all of their Freeze Dried Foods, starting now thru October 1, 2011. Across the nation during the month of September, families are encouraged to store extra food, drinking water, clothing, fuel, and other preparedness supplies that are necessary in the event of a natural disaster. Because of the preparedness focus this month, Nitro-Pak has created their biggest sale of the entire year - 15-25% off all of their freeze dried food products. Freeze dried food has a 25 year shelf life and is ready to serve by just adding water. President and CEO of Nitro-Pak, Harry Weyandt, had this to say about the sale: "Our customers can now save up to 25% on our Mountain House Foods and other products throughout the website. Our Backpackers Pantry and Mountain House Foods both offer 25 shelf lives. Families can be protected now and for the next 25 years." Freeze-dried food packages range in price from just a few dollars for individuals meals up to thousands for a year supply of food storage. For more details and product specifics, visit Nitro-Pak.com. Concerning the high demand for Mountain House foods and other freeze-dried foods offered from Nitro-Pak, Weyandt also says, "We fully expect supplies to sell fast. Some are very limited. As the economy gets worse & the election worries get underway, you can never be certain of the future. You can't eat Silver or Gold." Nitro-Pak is going the extra mile to provide lower prices throughout their website to help families get better prepared in these turbulent and uncertain times. Nitro-Pak has been offering emergency preparedness products for over 25 years. As an industry leader in emergency preparedness products, Nitro-Pak has been a great resource for many individuals and families. Nitro-Pak continues to offer competitive prices and quality products that satisfy any emergency preparedness need.